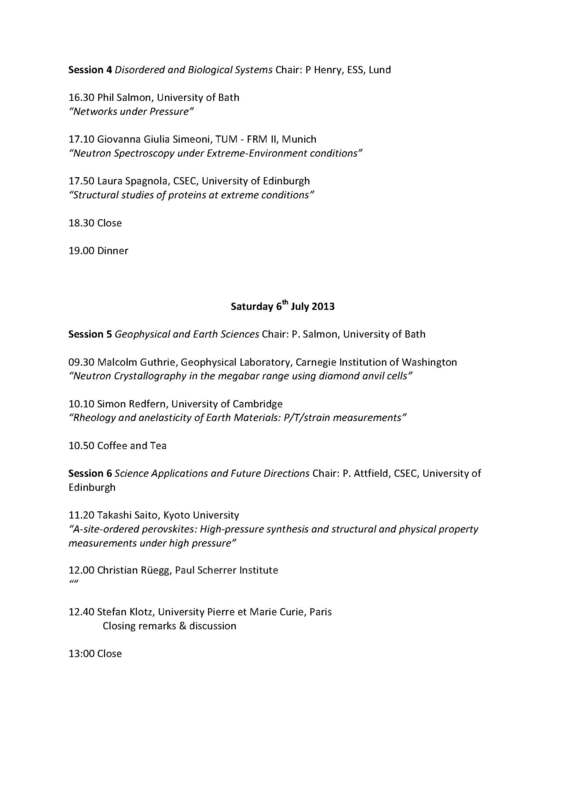 This symposium was held on 5-6 July 2013 and explored and defined the opportunities for extreme conditions science at the ESS. Craig Bull (ISIS), Malcolm Guthrie (Geophysical Laboratory), Takanori Hattori (Japan Atomic Energy Agency), Paul Henry (ESS), Konstantin Kamenev (University of Edinburgh), Michael Meissner (ESS), Karel Prokes (Helmholtz Zentrum Berlin), Simon Redfern (University of Cambridge), Christian Rüegg (Paul Scherrer Institut), Takashi Saito (Kyoto University), Phil Salmon (University of Bath), Giovanna Giulia Simeoni (TUM - FRM II), Laura Spagnolo (University of Edinburgh), Chris Tulk (Oak Ridge National Laboratory). J.P. Attfield (Edinburgh), U. Häussermann (Stockholm), P. Henry (ESS, Lund), S. Klotz (Univ. P et M Curie, Paris), J.S. Loveday (Edinburgh). The 1.5 day meeting will be held in CSEC on the Kings Buildings campus of the University of Edinburgh, starting on the morning of Friday July 5th, and ending at lunchtime on Saturday July 6th. If you wish to present a poster then please also send a pdf abstract, showing the title, authors (with presenting author underlined) and abstract (which may include figures). Maximum abstract length - 1 page of A4. 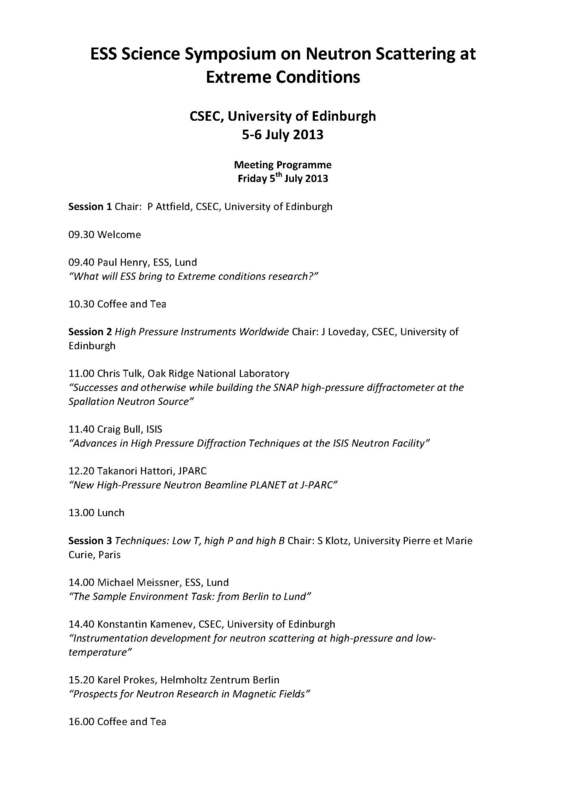 Science and Scientists at ESS: Monday 8 July, School of Chemistry, University of Edinburgh.